In the Mobility Shop you will find tools to keep you active. 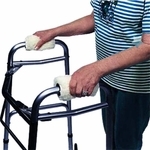 We carry canes ranging from folding travel canes to bariatric quad canes. Rolling Walkers, commonly referred to as Rollators, and walkers to fit every weight and height are also listed here.